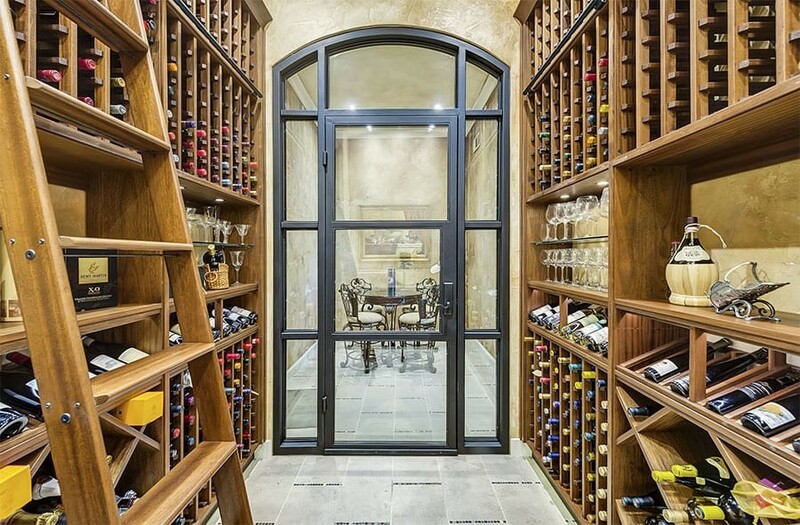 We collaborated with the designer, builder and homeowner to design and install a high-end custom wine cellar for a serious wine collector in Plano, Texas. 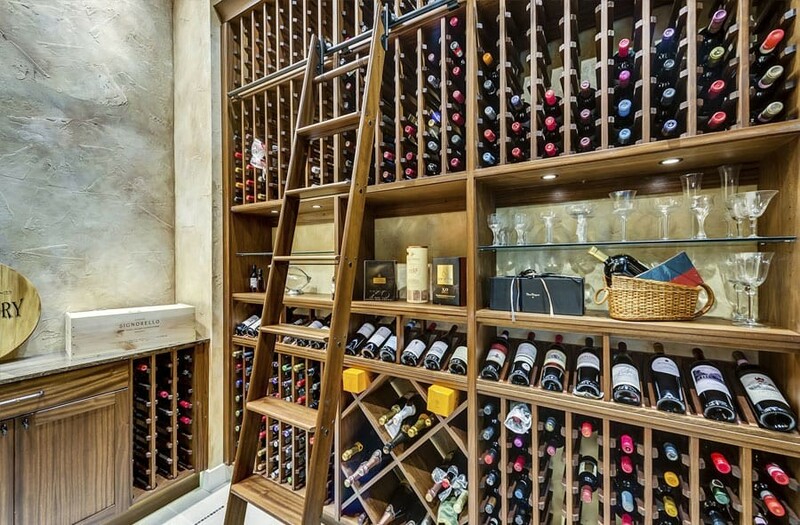 The project goal was to create ideal storage conditions for 1,000 wine bottles, with counter space, racking for different size bottles, and a rolling ladder to reach racking near the ceiling. 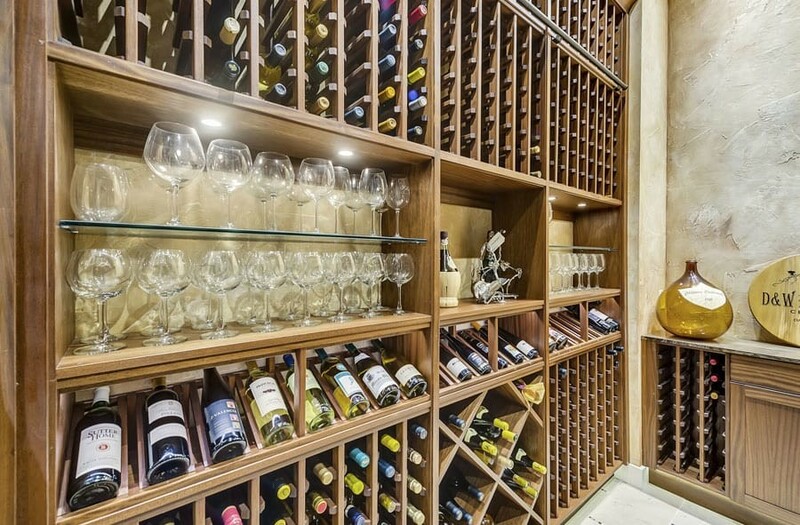 The cellar capacity is 1,230 bottles, using elegant Sapele Mahogany, finished with a walnut stain and furniture grade satin finish to protect the wood and provide a beautiful look and feel. The cellar is refrigerated by a fully ducted CellarPro 4200VSi self-contained cooling unit that is located in the attic. Supply and return ducting were run to the ceiling in the cellar, and the cooling unit digital controller was remotely installed on the outside of the cellar entry door. By ducting the cooling unit, the cellar gained additional racking capacity, and benefited from a cleaner aesthetic inside the cellar. In addition to the wood racking, glass shelves were installed to display treasured wine accessories and decor, adding ambiance to the room. Granite-backed counter tops were installed for additional display and prep areas. The toe kick, display shelves, glass displays and crown are dramatically illuminated with low-heat LED cove lighting. The racks were constructed with box frames and were shipped semi-assembled and ready to install, similar to high quality cabinetry. In contrast to stick-and-ladder racks, these box-frame racks significantly reduced installation time and cost.